This is not an 'official' XCRI project database, and indeed one could not produce such a thing as XCRI is concerned with exchange as opposed to long term storage of information. It has not been thoroughly tested (it won't work on SQL Server 2005 as is, because the SQL uses new date datatypes) and some of the namespaces may not be as recommended. There is a user-defined data type for URI, and a custom XML schema for XHTML. Generalization, where possible, was used instead of one-to-one matching of CAP elements to database tables. For example, course descriptions and course and presentation attributes are consolidated in three tables. Extensibility (particularly geared towards ease of importing new vocabularies) was a design consideration. A variety of primary keys were used (URIs, UNIQUEIDENTIFIERs, incrementing identity columns) for comparison, although not necessarily as good practice. Pascal case table names, matching XCRI CAP 1.2 elements where they directly correspond. Course title components allow for selective reordering and sorting (but not separate styling). 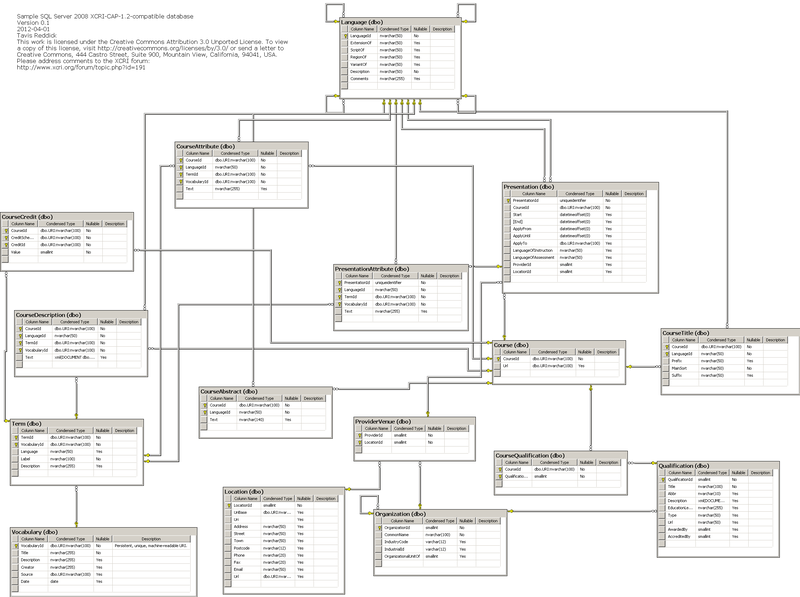 Importing data is discussed in Populating the sample SQL Server 2008 XCRI-CAP-1.2-compatible relational database. Exporting data as XCRI CAP 1.2 is discussed in Sample SQL Server 2008 code for extracting XCRI CAP 1.2 XML from a relational database. Validation of output in the database. Storing of snapshots (in XML columns performing validation as above? ).